Take a Chapman Stick, add a lot of tech in its belly and jam a USB cable up its jacksie and you get something that looks vaguely like an INSTRUMENT 1. 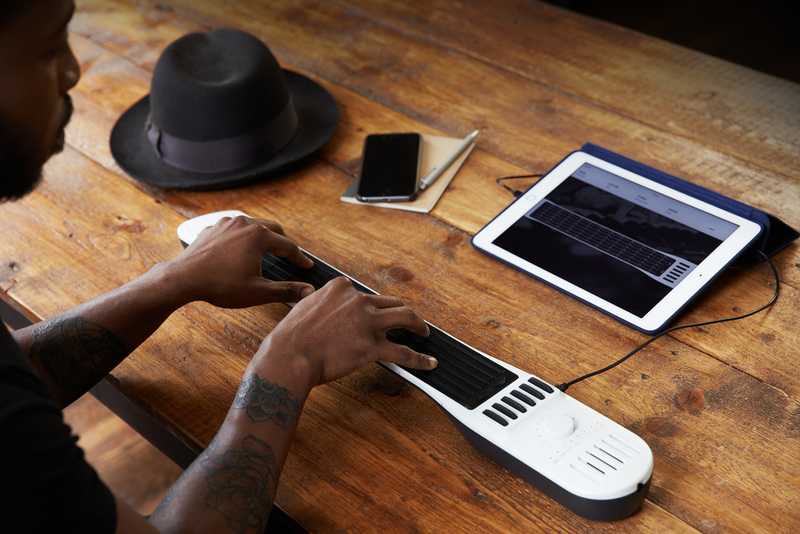 It’s a completely new type of musical instrument developed by Artiphon. Funded through a seven-figure Kickstarter campaign, the instrument is shipping now, and we can’t wait to see what people will be creating with it. The campaign has seen a number of setbacks and delays, mostly around a familiar theme: Going from prototype to mass manufacturing is really hard. Trying to figure out how to work with manufacturing partners, especially, can be tremendously difficult, as the company’s letter to its Kickstarter backers a few days ago explains. It looks like the problems are now a thing of the past, however, and the company’s INSTRUMENT 1 is now available to order for a surprisingly modest $400. Trying to explain what the instrument actually is is easier said than done. It can be played as a guitar or as a keyboard, but it also has pressure sensitivity and an accelerometer built in, which can add a layer of creativity on top. In fact, just watch the video to get a feeling for why musicians are both scratching their heads and wetting themselves with excitement over this new cornucopia of creativity. To play the instrument, you can use the companion app that helps you pick sounds, tunings and so on. It’s also MIDI-compatible, which makes it compatible with a big fat pile of mobile and desktop apps for creative music creation, including GarageBand, Animoog, SampleTank, Ableton Live, ProTools, Logic, Mainstage and many others. It is actually quite hard to know what to make of the product. In fact, even watching professional musicians trying it out for the first time is pretty funny. They recognize there is a new wave of creative potential hidden somewhere in there, but they also know that there’s a very definite learning curve to get to grasps with a brand new instrument. INSTRUMENT 1 delivers a steep learning curve, but also potentially boundless creativity. The only song you aren’t allowed to play on it is Stairway to Heaven. Stairway, Denied! OK, just kidding, you can, and it shows off the versatility of the INSTRUMENT 1 beautifully, to boot. Early reports suggest that INSTRUMENT 1 is a jack of all trades. We can’t wait to see whether it becomes the master of a new generation of musicians, too. Timed perfectly for Christmas, we wouldn’t be surprised if this little beauty makes it to the wish lists of many a geeky musician around the world this year.